Welcome to The Session – a collaboration of bloggers writing on a common beer-related topic. For the month of May, Mario Rubio over at Brewed for Thought chose Collaborations as the collective topic to explore. A round-up of all the blog posts can be found here. You can read more about Beer Blogging Friday (“The Session”) over at the Brookston Beer Bulletin. Collaborations are certainly a hot topic these days, permeating breweries and other peripheral beer communities – The Session being a prime example. For beer bloggers, the concept of collaborating ... about blogging ... about beer ... many times ends up being an exercise in abstraction. What really gets accomplished? What's the output? A few months back, Tom and I were kicking around ideas of how to structure a blogging collaboration where we actually “do something” as opposed to just talking/writing. The thought was to develop a collaborative gig which forces us to step away from the keyboard and go create something tangible. Armed with the concept and a few ideas, we reached out to Mike Tonsmeire over at The Mad Fermentationist - a beer blog that both Tom and I admire. While Mike was chest-deep in other projects, the “do something” notion must have resonated with him and a collaboration was born. But what to collaborate on? After several emails, we settled on Lug Wrench picking from Mike’s vast collection of recipes, brewing one or two beers on our system(s), and having all of us (Mike, Tom, and I) evaluate the result. How did our version compare against the original? How did the recipe hold up in another brewer’s hands? Mike further trumped the collaboration by offering to ship samples of his original beer (if it was available) for inspiration and side-by-side comparison. The plan was set. While the Pannepot clone was at the top the list, Tom and I delayed that brew until the next time we are able to brew together. The inaugural beer would be the Foreign Export Stout – a recipe modeled after Pelican Pub & Brewery’s Tsunami Stout, which uses no crystal malts, focusing on base malt, roasted grains, and some flaked barely to tie it all together. Mike's original batch unfortunately fell victim to an infection resulting in the whole batch being dumped. As such, we're all interested to see how it would turn out. Lug Wrench’s attempt at the Foreign Export Stout was brewed back on April 10th with the recipe and notes are provided below. After 18 days of primary fermentation, the jet-black nectar came out of the fermentor ready to be bottled. Possessing a tremendously pleasant dark chocolate nose (think high-end boutique chocolate), the beer was still a bit 'green', requiring some more conditioning time to mellow and meld together. However, the initial taste (albeit, warm and uncarbonated) revealed a complex dark malt character with a lot of potential. Only time will tell. At the time of this post going live, I've been able to ward off the temptation of cracking open a bottle and sneaking a taste. Look for the first tasting results sometime at the end of May, when the three of us will be able to make a determination about how the beer came out. I'm particularly interested to get Mike's thoughts and feedback from the bottles being mailed to him - did our version of his recipe live up to his original expectations? Would a recipe tweak be warranted based on the results? Was it worth all the effort? With regards to our collaboration concept, I won’t speak for Mike, but from the Lug Wrench perspective the “do something” project has been worthwhile. The cooperative effort sparked a considerable amount of healthy communication and we’ve got something tangible in the end. The odds are very favorable of another Mad Fermentationist recipe being brewed and discussed again here in the future. No additions were added to the water. Aeration accomplished via an aquarium pump and sanitary filter for ~30 minutes. 4/11/10 – Pitched entire yeast starter at 3am with fermentation temperature set at 61 degrees F. Added 7 drops of foam control into fermenter to prevent excessive blow off. Kicked off visible fermentation activity in < 12 hours. 4/14/10 – As activity showed signs of slowing, the fermentation temperature was ramped up 2 degrees/day until 66 degrees F to help finish the beer out. 4/25/10 – No real fermentation activity visible. Ramped fermentation temperature up to 68 degrees F in preparation for bottling. 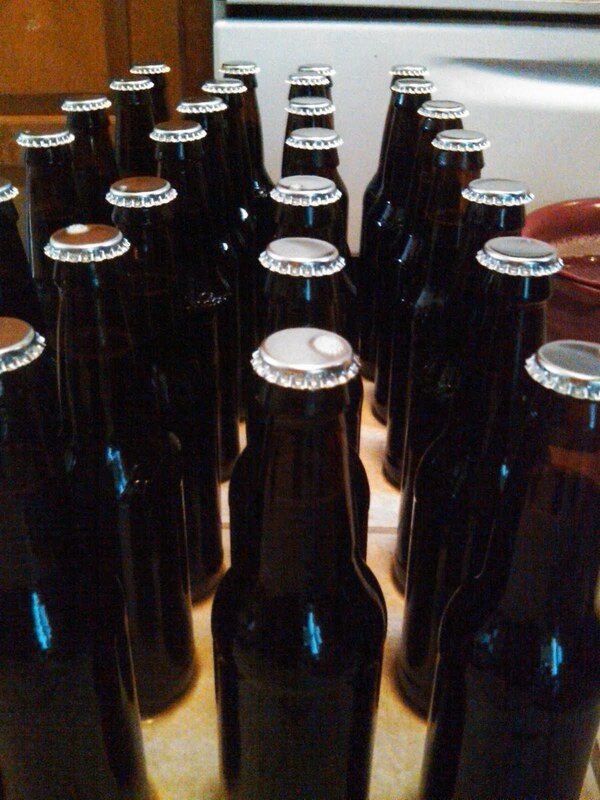 4/28/10 – Racked beer onto priming sugar (~2.2 volumes CO2) and bottled. The beer is still a bit edgy/rough at bottling, so some conditioning time in the bottle is needed. 5/24/10 - After recieving several bottles, Mike (a.k.a. Mad Fermentationist) was able taste the results and give us feedback on the beer. His comments, posted on his blog, can be found here. 5/30/10 - We had the opportunity to taste the beer allowing us to scribe these tasting notes. Very cool. I like the "Do Something" tag.